Lewis Hamilton stole pole position away from Mercedes Formula 1 teammate Nico Rosberg, as Ferrari slipped behind Red Bull during qualifying for the Spanish Grand Prix. Both Mercedes drivers made mistakes on their first runs in Q3, with Hamilton locking his brakes heavily at Turn 10. 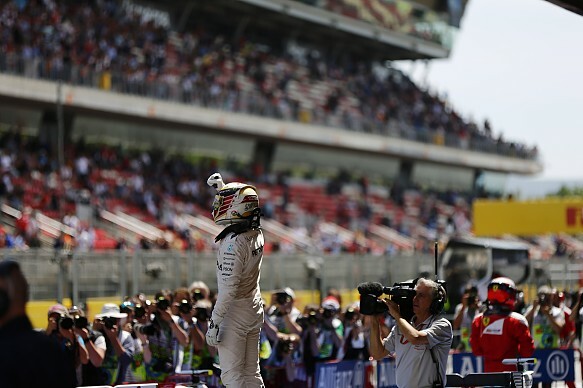 But the reigning world champion recovered to bag pole on his second run by 0.280 seconds from teammate Rosberg. Daniel Ricciardo qualified third fastest for Red Bull, six tenths behind Rosberg’s Mercedes and just over two tenths clear of new teammate Max Verstappen, who had split the Mercedes after the first runs in Q3. Ferrari endured a disappointing session, after looking close to Mercedes’ pace in practice. Kimi Raikkonen was fifth fastest, just 0.026s slower than Verstappen, while teammate Sebastian Vettel qualified 0.221s further back in sixth. The Williams of Valtteri Bottas beat Carlos Sainz Jr’s Toro Rosso to seventh spot by just over a tenth, with the Force India of Sergio Perez and Fernando Alonso’s McLaren-Honda (the team in Q3 for the first time this season) rounding out the top 10. Nico Hulkenberg’s Force India split the two McLaren-Hondas, failing to make the top-10 shootout by just 0.011s. Jenson Button was 12th fastest, just under a tenth clear of Toro Rosso returnee Daniil Kvyat. Romain Grosjean sat inside the top 10 after the first runs in Q2, but fell back to 14th after disappointingly failing to improve on his second run. He was split from Haas teammate Esteban Gutierrez by another impressive performance from Renault’s Kevin Magnussen, who qualified 15th fastest in his under-developed car. The Williams of Felipe Massa fell unexpectedly in Q1, after he aborted his second run. He ended up 19th fastest, just behind the Renault of Jolyon Palmer, who briefly looked set to make it through to Q2 before a late improvement by Button’s McLaren. Palmer swore over team radio when informed he had just missed the cut. Sauber and Manor brought up the rear of the grid. Marcus Ericsson trailed Felipe Nasr after their first runs, but improved substantially on his second to finish 0.377s clear of his Sauber teammate. Pascal Wehrlein also turned tables on Manor teammate Rio Haryanto during their second runs, with a lap that put him 0.194s clear of the Indonesian and less than two tenths shy of Nasr’s Sauber.